Old age gets to even the most youthful of people. My maternal grandfather, 89 years old, is having trouble bicycling uphill because his balance has worsened. Ever the tinkerer, he cannibalized his stored bicycles, welded and built a double front wheel bike (last year it was a simpler attempt at just fastening a spare bike wheel on the side of the back wheel, which sent him toppling into the trench). Note the upward-shooting little rods that prevent the wheels suddenly twisting about 360 degrees if one was to turn too sharply. Apparently, having two front wheels is much different to riding a normal bike. You cannot turn as sharply, and any bumps in the road jerks about the bike more forcefully. The most obvious difference is that the instinct to turn your body over to one side to prevent the bike going where you don't want it to go, is null and void for a double front wheel assemblage. Instead, trust in steering alone to take you in the right direction. 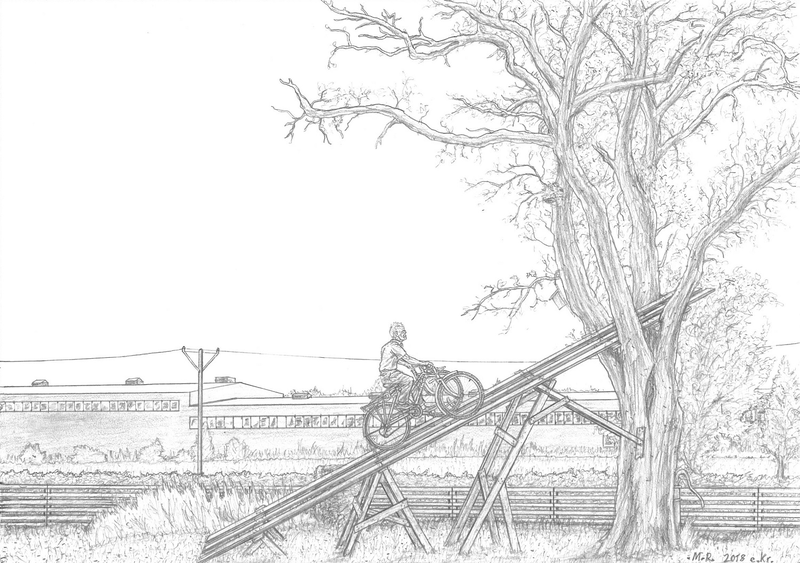 On first tries, the bike will tend to move toward the trench forcing you to stop and jump off, but handling the double front-wheeler correctly is quickly learnt. This is Mark II. Mark I was a red bike, and welded fast steel-to-steel. Grandpa switched to the purple bike for its more numerous gears, yet was surprised to find that the purple bike was made all out of aluminium, which do now weld with steel. This was a hurdle for swearing, but not an overly large problem to overcome for an old farmer who knows his trusty workshop (the anvil is a short piece of railway rail). This is awesome! What a legend your grandpa is KNC! In my experience older people don't have much time for "You can't do that!" Thanks! He's living the eccentric legend. Some decades ago he fell off the roof when cleaning the chimney, and expected to die. He didn't, so he climbed back up and finished cleaning the chimney, since he knew his muscles would soon ache too much for him to be able to do it in the coming days. When much younger, he once had a pig dead from disease that he wanted to dispose of. Instead of burying the cadaver, he cut it in half and tried to burn one half in the wood-fired oven for heating the house. The pig fat made the flames shoot up from the chimney, burning the top bricks of the chimney asunder. He then had to scrape clean the chimney from pig tar, filling some paint buckets with the stuff. A true inspiration! Not to speak of my paternal grandpa, now deceased, who once bicycled all the way to Greece along with a friend... through Communist East Europe. How far is it across the sea to Poland? Perhaps something like 300 kilometres? Going by ferry that way, of course. Some days ago, grandpa turned 90... twice. Does that make him 180 years old? When his family fled from Finland during the second world war, the Swedish authorities misregistered him, and the error has stuck. Apparently when he turned 50, he and grandma travelled away so as to not be attended with a big party on his actual birthday, but the problem was that they still were home and unprepared when guests began turning up at his second birthday date. I'm just amused about being "home and unprepared" when guests show up to party. I'm going to chalk it up to cultural differences. If that's the way it works I'd be sure to flee the area when it was my birthday too. Do you guys remember Evel Knievel? Cheers! I'm all for a pinch of craziness. He was a huge star in the 70's. My friends had Evel action figures.